Hey, at least Carla Bruni isn’t Jewish . . . or Israeli and Jewish. That would be a real no-no. 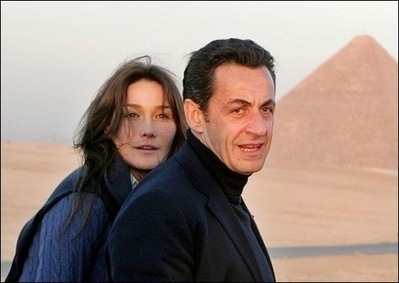 But Saudi officials are urging French President Nicolas Sarkozy not to bring his girlfriend Carla Bruni to the country during his visit to the Kingdom of Saudi Arabia on Sunday, after several Egyptian officials criticized Sarko for sharing a hotel room with Bruni in Egypt. It’s not that, with so many “boyfriends” (euphemism) like Mick Jagger and assorted others, Ms. Bruni is the most used piece of equipment in the international gym. That wouldn’t bother Saudis, who have their own stable of concubines, in addition to their twelve-plus wives. It’s that Sarkozy–like all of Bruni’s other paramours–is not married to Bruni, and that he isn’t a Muslim Saudi of the upper classes. And that’s a leh-leh [no-no] in the Islamo-fascist bastion of Saudi Arabia–you know, our “moderate” “ally” in the War on Terror in the Middle East. Even though, Saudi royals and bigshots can always violate Islamic law at their leisure, infidels cannot. By now, you–and Monsieur Sarkozy–should be used to the hypocrisy. “Do as I say, not as I do,” is the cardinal rule of Islamists. Sarkozy was warned–and the warning was publicized to the Associated Press and other mainstream media outlets–that he should leave the Bruni bim behind, since sharia a/k/a Islamic law does not permit unmarried couples to be alone together. And, as I noted above, that Islamic law applies more to infidels, than it does to the Saudi elite class that is warning Mr. Sarkozy. It’s all a show for the Bin-Laden fans who comprise the Saudi masses. They must see that their unstable leaders–whom they’d overthrow if they could–are telling outsiders, “You must obey Islamic law in our land,” even if those uttering the warning don’t obey it in their land, themselves. So, what was that about Islam being a “tolerant” religion and Saudi Arabia being “moderate”? And let’s not forget Condi Rice who loathes Jews… and is now on record as telling the Jerusalem Post that she considers east Jerusalem to be territory to be cleansed of Jews. No building, no buying a home there and no having children – aka no natural growth. Thar applies not just to Har Homa or Maale Adumim but to Judea and Samaria. Its ugly Jews are ordered around in their own country by Secretary Rice like she is a Roman potentate. What ever happened to being a “free people in our land and in Jerusalem?” If Secretary Rice gets her way, you can pretty much kiss Israel’s future buh-bye. Just the way the State Department wants it. Hmmm, turnaround is fair play. Sarkozy, as the President of France, should tell the Saudis to leave their multi-wives, concubines and harem at home and kick out the Saudi Ambassador’s harem in France. The rest of the West should do the same.